There are sim racing pedals and then there are sim racing pedals! You can buy FFB steering wheels that come with pedals, in general these pedals will be useable but if you are serious about sim racing they will not really be good enough. As far as I am aware none of the pedals that come with a steering wheel have a load cell - which allows for the more pressure you apply to transcend to the output. Also unless you buy a bodnar cable the pedals will only have 256 points of travel compared to a USB pedal set that will have 1024 points of travel, which in it's self allows for much more accurate braking. Serious sim racers will spend serious money getting the right pedal set. However, at this time I believe that there is not very much choice in the market place for medium - high end pedals, your budget will essentially decide which pedals you should buy. CSR Elite Pedals are now available and replace Fanatec's previous offering of the Club Sport Pedals, which also had a load cell and were not only beautiful but also amazingly designed and manufactured to the highest standard. Personally I don't think these look as good as the previous version, however, it's performance that counts. The CSR Elite Pedals are a completely new design with improved ergonomics. 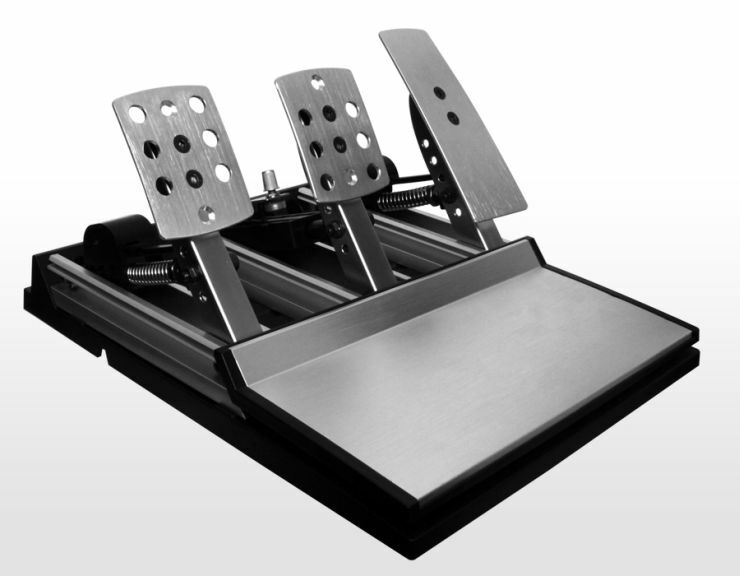 These new sim racing pedals are the most affordable on the market that use load cell brake technology. With a load cell, muscle memory is used versus positional memory as the load cell is engaged. Load cell brakes are used to simulate the feel of a real world car. With a vast array of adjustability , you can make the CSR Elites load cell brake go from something similar to a street car up to a very stiff racing brake. These new sim racing CSR Elite Pedals are made completely of premium aluminum, the gas, brake and clutch pedals have improved rigidity and feel over the Club Sport Pedals. Features pressure sensitive Load Cell technology. 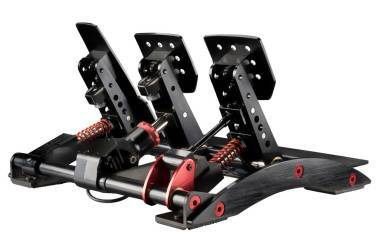 Fully adjustable pedal positions both vertically and horizontally, spring tension and pedal angle also adjustable. I believe that these new pedals are the first to offer an optional Inversion Kit. 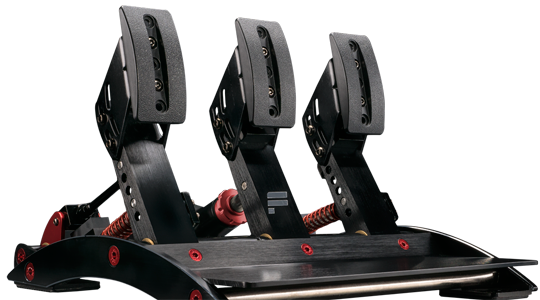 The Fanatec Clubsport V3 pedals feature advanced technology. Nothing will make you faster than a set of good pedals. Fanatec are using the latest and most advanced technology to give you an advantage over your sim-racing competitors. They feature a 90 kg adjustable Load Cell. The custom made load cell is extremely durable and much more precise as the one in V2. You can apply a realistic and strong pressure and precisely control the brake with muscle tension just like in a real car. There are countless ways to adjust the Fanatec V3 pedals according to your racing style and ergonomics. The New Pedal Plates are D-shaped pedal plates and the new pedal extensions now allow to sim racers to adjust the angle of the pedal plate and the angle of the whole pedal arm. Not only that but there is Adjustable Brake Stiffness. This completely new design of the brake allows adjustable stiffness plus travel of the brake pedal without using any tools. Contactless Hall Sensors with 12 bit resolutionContactless Hall Sensors with 12 bit resolution plus completely revised electronics and magnetic hall sensors of the gas and clutch feature 4x the resolution of the V2 pedals. Each axis can be calibrated in the wheel or in the driver. If this all seems a little expensive for your sim rig there are DIY pedals options, maybe this diy pedal guide parts article will help. If you are interested in constructing a brake pedal using a load cell interface that would appear to be a good start. 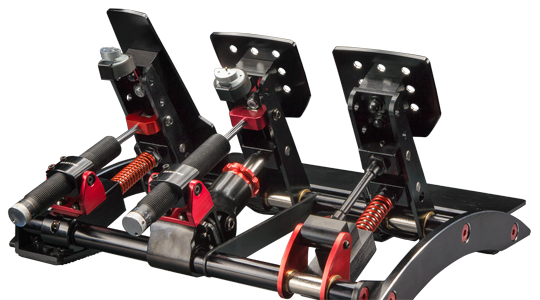 If you are thinking of building any form of sim racing equiptment or you need to improve basic brake pedals then the place to visit/person to speak to is Leo Bodnar, he knows a thing or two about sim racing and sport pedals.